The Chorus of the Southern Finger Lakes is an enthusiastic community of volunteer musicians who perform with the Orchestra of the Southern Finger Lakes. Boasting on average 60 voices, and for some performances up to 80, the Chorus make it possible for us to perform some of the greatest musical works, such as Handel's "Messiah" or Mozart's "Requiem." There's nothing quite like singing with a full symphony orchestra. The experience has been called "powerful," "life-affirming," and "breathtaking." Chorus members come back year after year to perform with the region's premier professional symphony orchestra. The Holiday Concert at the Clemens Center in Elmira. The chorus sing carols and holiday favorites, as well as a classic such as the heroic fourth movement "Ode to Joy" from Beethoven's Symphony No. 9, and of course, Handel's Hallelujah Chorus. The May Concert at the Clemens Center in Elmira will feature classical works such as Brahms' Schicksalslied, Nänie, and excerpts from the German Requiem. Check out the line-up for this season's concert here. 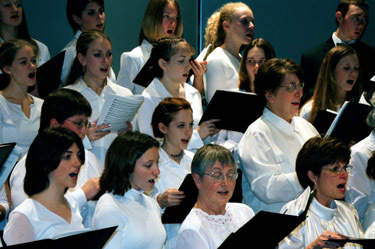 Smaller subgroups from the Chorus prepare and perform for a variety of special events. Most recently an octet performed at Sparkle in Corning and at the Arts Council's Awards Ceremony. Previously a women's chorus subgroup performed on the opening concert with the OSFL​ in "Neptune," the final movement of Holst's The Planets. Weekly rehearsals are Tuesdays 7 PM to 8:30 PM at Grace Fellowship Church, 129 Cutler Ave., Corning. Singers of all ages are invited to join the Chorus of the Southern Finger Lakes for its 2018-2019 concert season. The Chorus doesn't hold auditions, but you must register to participate. To register, you can either call the OSFL Office at (607) 936-2873 or email Irene Peterson, Chorus Manager, at chorus@osfl.org for more information.